ISS Expedition 12 commander Bill McArthur smiles as recovery crews and doctors tend to him after landing on the steppes of Kazakhstan on April 8, 2006. Threeastronauts returned to Earth Saturday, ending six months aboard theInternational Space Station (ISS) for one crew and a historic first spaceflightfor the country of Brazil. ISSExpedition 12 commander Bill McArthur, flight engineer Valery Tokarev andBrazil's first astronaut MarcosPontes smiled for cameras after their Soyuz TMA-7 spacecraft touched downon the steppes of Kazakhstan in Central Asia. "It was aheck of a ride," McArthur said after landing, comparing it to an amusement parkride. "It was like Mr. Toad's Wild Ride, you'd love it." "For methis has been a very special week," Pontes said Friday. "It was my first flightand it was the first flight for Brazil. I am very happy." Pontes rode up tothe ISS on March 29 with the space station's new crew, Expedition13 commander Pavel Vinogradov and flight engineer Jeffrey Williams, whichwill spend the next six months aboard the orbital laboratory. 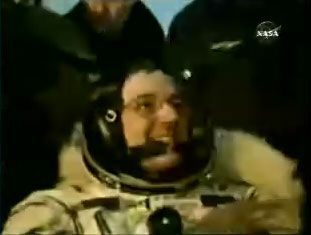 "I'm surethe space station will be in very good hands from now on," said Pontes, whoinitially trained for a shuttle flight since 1998 only to securea Soyuz seat last year. McArthur,54, and Tokarev, 53, staged two spacewalkssince they arrived aboard the space station in October2005. They also tossed an unmanned Russianspacesuit into orbit as part of a radio experiment. Theastronauts became the first space station crew to dock a Soyuz spacecraft at everyavailable Russian-built port, and had the fortune of being in orbit duringa raresolar eclipse, in which the Moon's shadow was visible on Earth. "I wasdesperate to see it and it was certainly the opportunity of a lifetime,"McArthur said. "All I could see was a darkshadow below the station...it was pretty darn big." TheExpedition 12 crew had hoped to host NASA's second shuttle flight since the 2003 Columbia accident - STS-121aboard Discovery - which was to deliver a third ISS crewmember, EuropeanSpace Agency astronaut Thomas Reiter,to the orbital laboratory. Delays dueto ongoing fuel tank foam and sensor modifications for STS-121's external tankhave pushed the spaceflight's launch target to noearlier than July, placing it within the Expedition 13 crew's increment. "We'd liketo wish the crew of [Expedition] 13 a successful, uneventful in the good sense,mission," Tokarev said before leaving the ISS. Expedition13's Vinogradov and Williams said they were eager for Reiter to join them inJuly and also hope for another shuttle mission in August. That second missionis expected to restart stationconstruction efforts, which have been stalled since the Columbia accident. "Werelooking forward to the weekend, to rest up for a little bit then we'll get downto business," Williams said after Pontes and the Expedition 12 crew departed. Beforelaunching toward the ISS in October, McArthur said he expected Expedition 12 tobe his lastspaceflight, something his wife Cindy - who works in NASA's educationoffice at Johnson Space Center - is looking forward to. "Iencouraged him to make that decision on his own," Cindy McArthur told SPACE.comduring the Expedition 12 mission. "He thought it was time for other people tohave a chance to fly. It will be interesting to have him home for awhile, he'sbeen traveling so much." A retired U.S. Army colonel, Bill McArthur is a veteran of four spaceflights - three of which aboard NASA space shuttles - though Expedition 12 is his first long-duration flight. Expedition 12 also marked the first long-duration flight for Tokarev, who flew aboard the Discovery orbiter during the STS-96 mission. Cindy McArthur planned to greet her husband in Russia's Star City with their twodaughters - one of whom is pregnant with the couple's first grandchild - and ason-in-law. Earlierthis week, Bill McArthur told reporters that he, and the rest of his relatives,will learn whether the new child is a boy or girl together as a family. "It will bejust a delight to see them all," McArthur said.